West Granary, Ashton Court Holiday Cottages in Ashton, near Leominster sleeps 6 people. Situated within the owner’s grounds, these semi-detached cottages offer cosy holiday homes from which to explore the surrounding area. Family friendly, there is an outdoor children’s play area, pool table and table football and leisurely walks. On site meals are also available by prior arrangement. There are many National Trust houses and gardens, plus places of historical interest, including castles and museums to visit. The area is popular for walkers and cyclists, whilst golf, horse riding and fishing can all be found locally. Leominster and Ludlow, famous for its culinary delights and food festivals, are within easy driving distance. Shop and restaurant 4 miles, pub 3 miles. Ground floor: Kitchen with tiled floor. First floor: Living room with dining area, patio doors and beams. 2 bedrooms: 1 double (5ft zip and link) with beams and Velux, 1 twin. Bathroom with shower over bath and toilet. Second floor: 1 double (5ft) bedroom with Velux and en-suite shower room with toilet. Both properties (refs 28957, 28956 [East Granary]): Gas central heating, electric, bed linen and towels included. Cot and high-chair on request. Freeview TV. DVD. Electric cooker. Microwave. Shared laundry area with w/machine and t/dryer (honesty box). Dish washer. Fridge/Freezer. Wi-Fi. Large, enclosed, shared garden with patio, terrace, sitting-out area and furniture. Shared natural grounds. Shared Bar-be-que. Shared children’s play area. Parking (2 cars). Cycle store. Shared games room with pool table and table football. Welcome pack. No smoking. Holidays run from Friday to Friday. NB: Slopes and steps in garden. Stream ¼ mile. For a better idea of where Ashton Court Holiday Cottages - West Granary is, you can see Ashton Court Holiday Cottages - West Granary on the map below. Ashton Court Holiday Cottages - West Granary is in Herefordshire; should you be on the lookout for a special offer, you can find all the special offers in Herefordshire. It's always worth checking to see what is on offer at the moment. 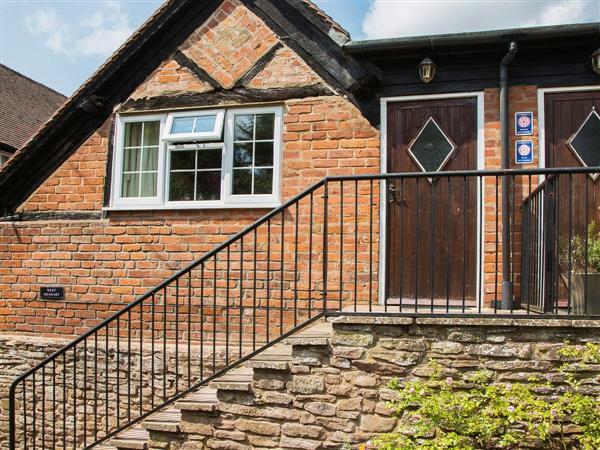 Do you want to holiday near Ashton Court Holiday Cottages - West Granary (28957), you can see other cottages within 25 miles of Ashton Court Holiday Cottages - West Granary; have a look to find your perfect holiday location.